The winning product, Bhasha, is a MOOC platform that uses publicly available content, such as videos from Khan Academy, edX, etc., and makes them available in native Indian languages. 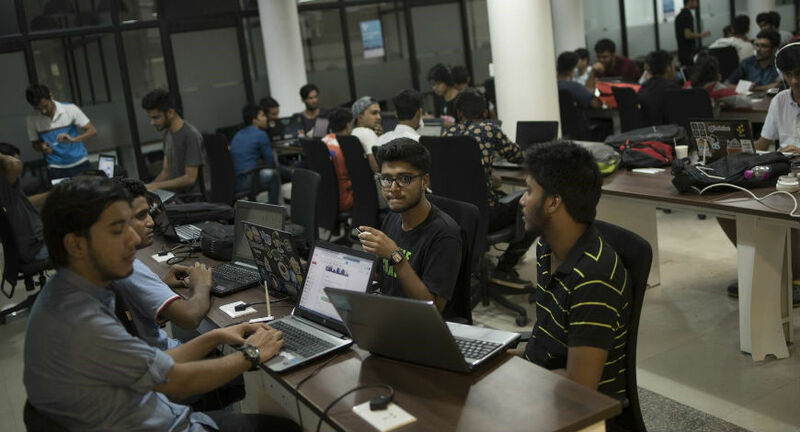 Oswald Foundation, along with Facebook Developer Circles Delhi-NCR and other partners, organised BharatHacks, a hackathon to solve India-specific problems, at 91springboard’s new campus in Sector 1, Noida. 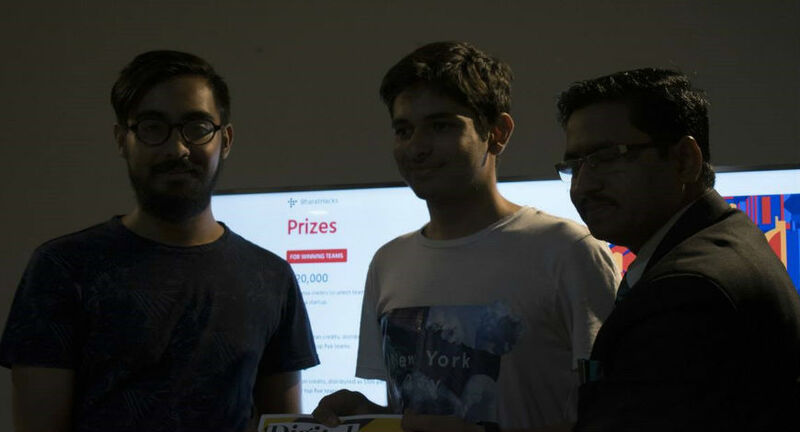 With 200 participants and a weekend of hacking, teams were required to build a tech product that solves a particular problem and pitch their prototypes to industry-leading investors like Anil Chhikara, Paritosh Sharma, Chandrashekhar Singh, Mohammad Sirajuddin, and Abhishek Kumar Gupta. These investors were joined by tech mentors from the organizing team — Anand Chowdhary (CEO of Oswald Foundation), Saransh Kataria (Chapter Lead of Facebook Developer Circles Delhi-NCR and founder of WisdomGeek), Nishant Gadihoke (CTO of Oswald Foundation), and Namanyay Goel (startup consultant for web & identity design). With over 30 teams, there were some incredible projects across all verticals, like mobile and web apps, bots, hardware devices, and portals. These products were built using BharatHacks’ partner platforms and APIs like Aadhaar Bridge, Digio, and Agastya to build India-centric startups. 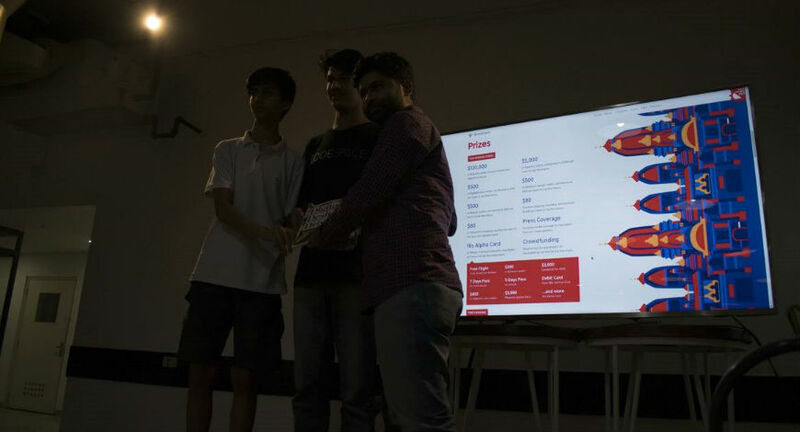 DigitalOcean and .tech provided free cloud hosting and domain names to participants respectively to help them showcase their products to the market. “The best thing that I could do with my short time in Delhi was to organise an event that truly contributes to the development of our nation. BharatHacks has presented some exceptional products that could potentially change the lives of the next billion users,” said Anand Chowdhary, the co-founder and CEO of Oswald Foundation, who recently announced that he’ll be moving to the Netherlands to start Oswald’s operations in Europe. These five teams have received prizes including $12,000 (over INR 7.5 Lakh) in credits as part of IBM Global Entrepreneur. They have also been awarded $100 in DigitalOcean cloud credits, $80 in online shopping vouchers by Cyankart, and press coverage by Bizztor. Finally, they will be getting the F6S Alpha Card that has over $1 Million in benefits, including $300 in GitHub credits, SendGrid Pro worth $3,000, $600 in Segment credits, free weeks at co-working spaces worldwide. Oswald Foundation is also sponsoring $1,000 in credits for their web accessibility widget, Agastya. The fourth runner-up was CreditEasy, a lending app for farmers. “We have built a peer to peer money lending system based on the concept of micro-financing, providing people a way to break free from the debt cycle. We are excited to be in the top 5 teams of BharatHacks Delhi-NCR 2017 and plan on taking our product forward in the coming months,” said Siladityaa Sharma. For farmers who are unable to acquire loans due to low credibility, the CreditEasy app provides a fast and trusted methods to raise funds from multiple lenders in a crowdfunding-style interface. “CreditEasy is an important idea that must get all the push needed to impact farmers lives. Access to ‘honest and easy credit’ will grow the agriculture ecosystem at scale. Imagine the day you get farm produce at your home that's grown without poison and pesticide that we normally consume,” said Paritosh Sharma, GM, Digital Desh by NowFloats, who was present as an investor at BharatHacks Delhi-NCR 2017. The third runner-up, UATU, is a fatigue monitoring system that uses computer vision along with AI-based facIal modelling to determine whether a user is nodding off or about to fall asleep. “Our team developed a product that aims to address the issue of fatigue management in high risk activities, especially in the industrial sector. By detecting when someone falls asleep on the job and how often that happens, we can help both employees and employers create better work environments that are both safe and productive. We’re excited by the prospects of developing this further and glad that BharatHacks allowed us to address India-specific problems, especially given that I was flying in from Singapore to attend the event and don’t often encounter platforms as such — those with great problem statements and mentorship,” said Agrim Singh. 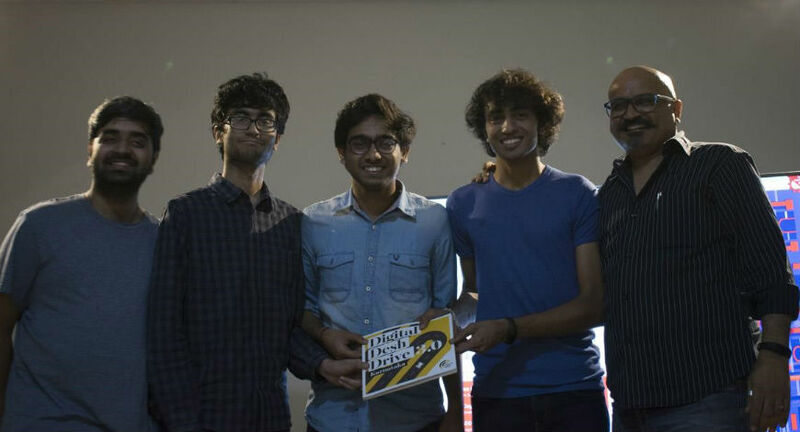 pitBot was the only hardware device that made it into the top five at BharatHacks, and was the second runner-up. pitBot is a robot which aims to improve and automate road and highway maintenance in India. “Enjoyable as well as intense, BharatHacks helped me take my project from a paper to a prototype in 24 hours, and to a finished product in a little bit longer,” said Yadullah Abidi, the sole developer of pitBot. This Arduino-based bot has a unique and innovative design that uses IR blasters to manoeuvre in the tightest of corners and the worst of streets, all while avoiding vehicular and pedestrian traffic. 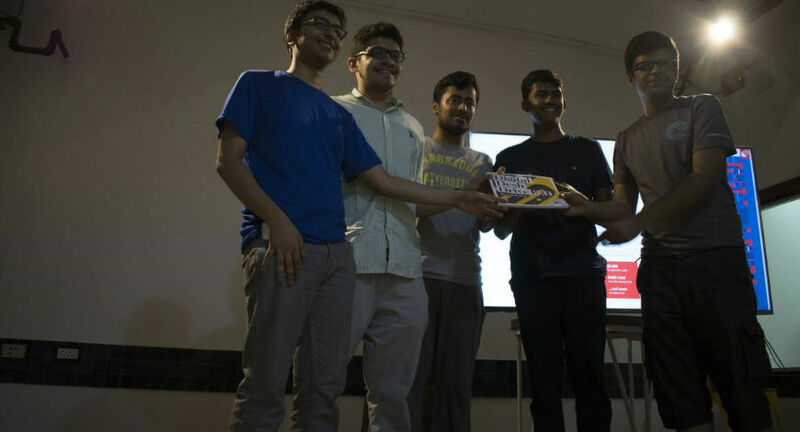 The first runner-up, OffPay, was one of the products that received investor interest at the event itself. The two-brother team built an Android app that once downloaded and configured, lets users recharge their mobiles or DTH connections, book cabs using Uber, post to Facebook and Twitter, and transfer money using Paytm, all offline. You heard that right, offline. OffPay uses token-based authentication, and communicates with the server solely via SMS, so users without a working data connection can still use their favourite internet services. “In rural India, a service that allows users to communicate with the web using just SMS is incredibly powerful. In places where even 2G internet signal is unavailable, OffPay’s technology, that lets people share on social media and especially recharge their phones or DTH connections, will make lives easier,” said Mohammed Sirajuddin, the Director of two of India’s largest crowdfunding platforms, DesiredWings and Catapooolt, who are offering free crowdfunding services and support to the top five teams at BharatHacks. The winning product, Bhasha, is a MOOC platform that uses publicly available content, such as videos from Khan Academy, edX, etc., and makes them available in native Indian languages. Their algorithm scrapes a video for its subtitles, translates them into regional languages, uses a text-to-speech algorithm to generate an audio track, and overlays the track on the original video while also accounting for pauses and background music. All-in-all, a user can change the language of a YouTube video on-the-fly, and enjoy the content in a regional language. This opens immense possibilities to get world-class study material and classroom content to regional languages at the flip of a switch. “With over 90% Indians speaking and consuming Internet content in Hindi and hundreds of regional vernaculars, the real India does not speak or understand English. By automating translation of millions of videos available on YouTube, Bhasha has the potential to take the amazing educational and entertainment content available on YouTube to the Indian masses,” said Anil Chhikara, one of the investors present at the event, who previously founded 24×7 Learning and led its growth in enterprise segment for over a decade to become India’s largest e-learning implementation company.